Three-star winners once already this year, Thieriot Stutes and The Chatwin Group’s Chatwin, a 10-year-old Oldenburg, topped Friday’s leaderboard on a score of 27.3. “I feel really lucky to ride Chat every day, and this division and the people I’m sitting next to are world-class so it feels amazing for this moment, but after I walk out of here I’m focused on tomorrow. Tomorrow is an entirely different day,” said, Thieriot Stutes. 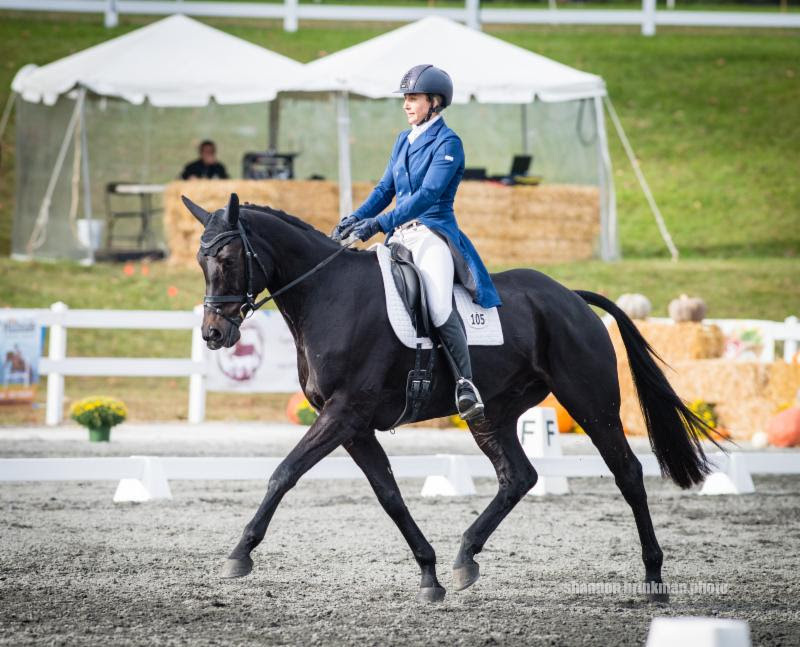 After almost a decade since her last Fair Hill International appearance, Thieriot Stutes, who is an amateur rider herself, has her former Advanced horse Fric Frac Berence on her mind as she and Chatwin take on this weekend’s challenge. Canadian Jessica Phoenix piloted Pavarotti, a 16-year-old Westphalian gelding owned by Don Good, into second place on a mark of 28.7. A seasoned competitor with multiple Olympic and World Championship appearances, Phoenix anticipates a healthy challenge from course designer Derek di Grazia. “The course looks awesome tomorrow. I think it starts beautifully, those first six fences, and then it starts really coming at you. It gets you in to a nice rhythm and then the questions start coming and they don’t stop until you get to the finish,” Phoenix explained. Caroline Martin and her own Danger Mouse landed in third. Martin and the 10-year-old Dutch Warmblood earned a 29 — a personal best for this pair. The CCI2* division welcomed a new leader on day two of the competition in Heather Morris and Charlie Tango, a 10-year-old Irish Sport Horse owned by The Team Express Group. Their morning result of 22.9 remained untouched throughout the afternoon. U.S. Olympian Boyd Martin found himself in second place with Christine Turner’s On Cue. The 12-year-old Ango European gelding carries 23.7 points into Saturday’s cross country phase. Anna Loschiavo and Melanie Loschiavo’s Spartacus Q peaked at precisely the perfect moment for third place in the two-star. The 9-year-old Hanoverian sits on a score of 25.8. The USEA Young Event Horse (YEH) East Coast Championships culminated Friday with the jumping and galloping portion of the competition. MB MaiStein and R River Star were crowned champions of the 5- and 4-year-old divisions, respectively. Tamra Smith was the third of the west coast contingent to best the competition at Fair Hill Friday as she and the MB Group LLC’s MB MaiStein finished first in the 5-year-old division. The Oldenburg gelding by Rocky Lee finished on an 88.29% (out of 100%), impressing the judges with his cross country efforts that earned him 13.5% (Out of 15%). Courtney Cooper’s R River Star proved once again to be the best of the 4-year-old horses Friday, winning on a final score of 83.24% (out of 100%) with Cooper riding. The Irish Sport Horse/Dutch Warmblood gelding, who was bred by the rider, is by Riverman and out of R Star. “He was great he was light on his feet. He was thoughtful. He looked for the jumps. We started him and did all the work with him. He’s really gotten down to business this last part of his four-year-old year. He’s come along and really done well,” Cooper said. Competitors take on the thrilling cross country phase Saturday Oct. 20 beginning at 9:15 a.m., and the show jumping finale will take place Sunday Oct. 21.